Clear, biodegradable, and made from plants. 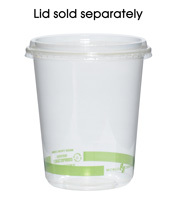 Lids are guaranteed to break down in 2-3 months in industrial composting facilities. Heat resistant up to 100 degrees F. Meets FDA specifications for food contact. Meets ASTM D-6400-99 standard for compostable products. One size lid fits 8, 16, and 32 oz. 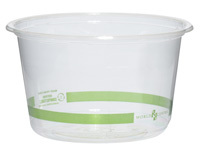 compostable deli containers.